He-Man and the Lost Dragon is a 1986 Masters of the Universe children’s book written by John Grant and illustrated by Robin Davies. Here, to create cover for an invasion of Eternia, Hordak attempts to unleash a horde of monsters on Eternia – and gets one benign stegosaurus. 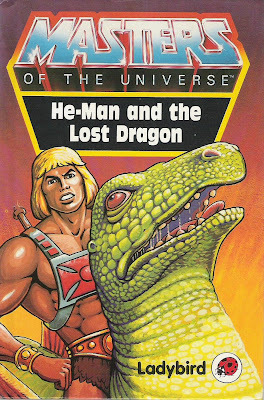 This is an expanded version of the short story “Dragon from the Lost Valley” from Ladybird’s 1985 He-Man and Masters of the Universe collection. Why we’re still hung up on this dinosaur being a “dragon,” I can’t say, but this is a quaint little story, and one that, aside from all Grant’s chronic non-canon telepathy nonsense, would have made a reasonably good cartoon episode, even if the degree of difficulty is on the low side. Even so, Grant’s attention to detail leaves something to be desired. In Masters of the Universe cartoons and mini-comics, dragons abound, yet the characters here treat it like some mythical creature. And Hordak’s ordnance is ridiculously powerful – why not drop one of those bombs on Castle Grayskull, on Snake Mountain, on the Royal Palace? Davies concludes his work on Ladybird’s He-Man books with some of his best art. Just as in the contemporary He-Man and the Asteroid of Doom, he does an excellent job duplicating the Filmation style, and his backgrounds are excellent. His use of color and shading is also quite strong. In the end, in spite of the usual letdowns from Grant, this is a perfectly enjoyable story.